When Middlesex by Jeffrey Eugenides was first published in paperback in 2003, I rushed out to buy it together with a copy of Donna Tartt’s The Little Friend. I read Tartt’s book but Middlesex stayed firmly unopened on my shelf. Then I moved house and it stayed unopened in one of the boxes of books I kept at my sister’s. Where it still hides, somewhere. I kept meaning to read it because of all the wonderful reviews floating around, but somehow it always seemed a little difficult: the subject matter, the writing, the thickness of the book. I gave a little whoop of delight when I realised this was to be the choice of my book group this month only to realise I no longer knew where my pristine copy lay, so I reserved one from my local library just in time to take on my little flying visit to Munich a few weekends ago. But oh, how I wish I had opened the first few pages and plunged in all those years ago, because it’s a beautiful book. 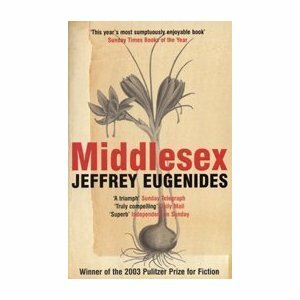 In Middlesex, Eugenides has really written the Great American Novel. It’s been compared to Franzen’s The Corrections, but I much prefer this one. It’s less gritty, amoral and depressing but there is a grand sweep of history, destiny and the cycle of life. No wonder it won the Pulitzer Prize for 2003. Eugenides tackles American, Greek and Turkish history, immigrant life, genetics, sexual theory and hermaphroditism in a way that increases your knowledge without overwhelming you. His prose is warm and sumptious and you can just sit back and let him work the magic because you feel like you’ve met these people and they live their lives for you. In the hands of a writer less talented, less rigorous, this book could have become too serious, too tragic, even boring. But it was a delight to read and kept me nose-in-book for hours and I finished this in three sittings. Pretty good going for literary fiction. Middlesex is the story of Calliope Stephanides and her family and how the recessive gene that culminated in her hermaphroditism travelled through her bloodline from Greek occupied Turkey to Detroit. How she grew up as a beautiful girl named Calliope to become a man named Cal. It’s not just about her, it’s about the people around her, her parents, her grandparents and all her cousins, her friends and lovers. It’s about growing up and the search for the self, trying to fit in, questioning. In no way did I find Eugenides’ treatment of Calliope’s story to be too dramatic or exploitative because everything in the book, especially her family, was one big drama. Yet it’s not all perfect either. The scenes with Cal as an adult didn’t feel as complete as those when she was growing up or about her family. And sometimes it confused me a little when Eugenides cuts from the present to the past (which he does frequently.) But these are tiny grains of sand in the shoe because it’s a beautifully realised book. And Calliope is probably one the most sympathetic, thoughtful and strong characters I’ve ever come across. I’m a big fan of Sophia Coppola’s film interpretation of Eugenides’ first novel, The Virgin Suicides. But you know what, I’m going to go back and read the book. Because Middlesex is probably one of the best books I’ve read this year, and Eugenides has fast become one of my favourite authors. This would have been a great book for the Women Unbound Challenge because it not only addresses the issues of gender and feminism in different societies and times but it’s a book about women. It’s really opened the scope beyond thinking about gender in a purely female/male dialogue to show that there is a whole area that hasn’t been addressed much in mainstream fiction. And I like the way Eugenides writes about women: gentle, funny and strong. Middlesex was my first Eugenides book, and while I liked it a lot, I think I actually liked The Virgin Suicides a lot more. The movie is very faithful to the book, but there is something about the book that feels much more organic than the narration did in the movie. I think you’ll really like it a lot! I loved this one too! I was expecting something completely different. It was so funny and moving. I loved Middlesex but I am glad to see that you mentioned the film adaption of The Virgin Suicides. Not only is it a great book, but for once the movie may even be an improved version. I have also seen the reviews on this around for sometime. It was also available in the library and I ignored it (may have been the size). It has now gone for a walk somewhere and I must try to reserve it before I leave for home! Glad to hear you liked this – it’s on my wish list of books I definitely plan to locate and read at some point! Do read The Virgin Suicides – it’s a brilliant novel, and I think it will make you appreciate Coppola’s movie all the more. It’s one of the most sensitive, intelligent and well-made adaptations I have ever seen. So glad that you loved this too! Reminds me, I need to update the RR’s blog. Harumph! Melissa: Me too. It took me by surprise and I loved it! Mystica: I hope you have a chance to read it while you’re still in Australia! Teresa: There were a lot of details but I didn’t feel it detracted from the story at all. I thought Eugenides did a great job in integrating all the facts within his fiction. Fëanor: Two interesting points! Yes, someone in my book group also mentioned how strange it was that Cal’s parents’ love for one another disintegrated so rapidly. In some ways it felt like in Eugenides’ world you can never recapture the love you felt early on in relationships. nodatomo: Hello! Yay, I hope you like it. And let me know what you think after you’ve finished! novelinsights: Can’t wait to see the overall score. It was a very popular book, wasn’t it?